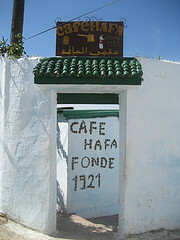 On a trip to Tangiers, my mum dragged my father and me to the Hafa Cafe. A book by Paul Bowles, called the 'Sheltering Sky' had inspired her to come to Tangiers in the first place and she insisted on visiting the cafe where Paul had spent many hours of his life. So we went. Now Tangiers is not in the top 5 of best places to visit in Morocco, I know that, but the Hafa Cafe is definitely in the top 5 places to visit in Tangiers. It's been around since 1921 and over the years it has attracted many artsy types such as artists, singers and writers and even the Beatles and the Stones have been known to come here to chill out. These days it's a popular hangout for locals smoking their shisha pipes as well as tourists who come here to rest their weary feet after a day of sightseeing. And I could see why. The setting is simply stunning. Hafa Cafe is set on a rocky cliff overlooking the Strait of Gibraltar and on a sunny day the views stretch as far as Spain. It's an open air cafe with terraces that slope down gradually, with lots of secluded nooks and crannies. Lots of privacy guaranteed. The must try drink is of course the sugar sweet mint tea, poured from a typically Moroccan silver teapot into authentically decorated tea glasses. It's very easy to spend a few lazy hours here, gazing across the Mediterranean. Oh, and don't miss the sunset, obviously. No better spot in Tangiers to see the sun sink in the sea. 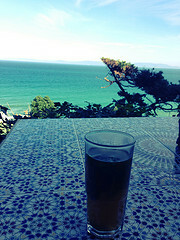 It's very lovely!! and very easy to try at home. Enjoy! !